Hovland was impressive during his Augusta debut. 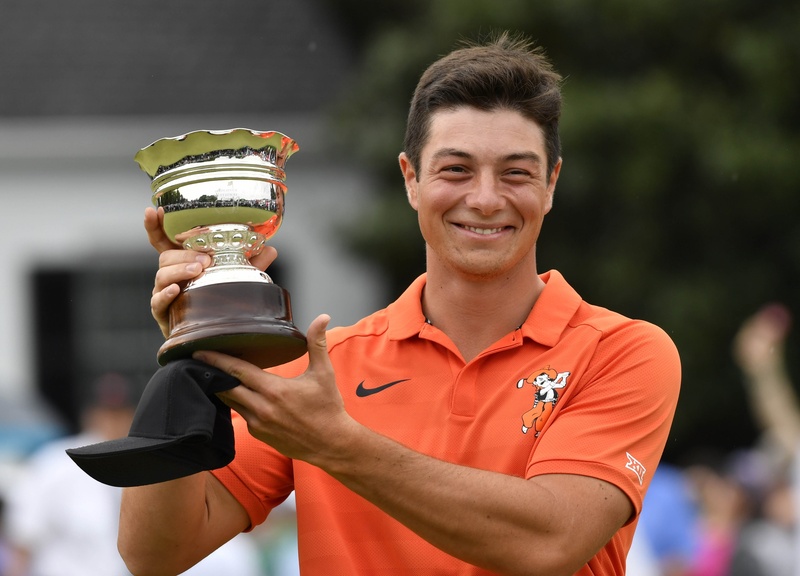 Viktor Hovland will go from sitting in Butler Cabin with Tiger Woods to returning to his academic duties in the span of 24 hours. Hovland was the low-scoring amateur of the 2019 Masters, holding off Alvaro Ortiz to earn the honor by a stroke. Hovland finished the tournament with a 3-under 285, finishing a stoke under par each of the final three days. Hovland started before Ortiz on Sunday and both started on the back nine. Hovland bogeyed his final hole, leaving an opening for Ortiz to tie with a par, but Ortiz also bogeyed the hole. Hovland finished the tournament tied for 32nd. When asked what he plans to do now, Hovland said his eyes are on becoming a back-to-back national champion. Rickie Fowler was the highest-placing former Poke. He finished tied for ninth with a 10-under 278, three strokes behind Woods. Fowler’s low round came Saturday, where he shot a 4-under 68. One of the highlights on the round was this eagle on 13. The 13th hole was good to the OSU contingent, as Hovland hit an eagle there Friday. Charles Howell III finished tied with Hovland at 3-under for the tournament. Howell too hit an eagle on the 13th hole, with his coming on Friday. Kevin Tway finished tied for 36th with his 2-under 286. Tway had a rough go of it Sunday and sat at 4-over for the round through 12 holes. After a pair of pars, Tway made three straight birdies and parred the 18th to finished with his weekend-high 1-over 73. Alex Noren completed the Cowboy field at the Masters. After making the cut, making Hovland and the former Pokes five for five, Noren finished tied in 62nd with his 8-over 296.